Thank you ness for all your help. We’ll keep you informed about my project, thank you !! Hope the build goes well for you, keep us updated. Yes everything is prefect you can send it. Here is your stair project with the step / riser assembly. 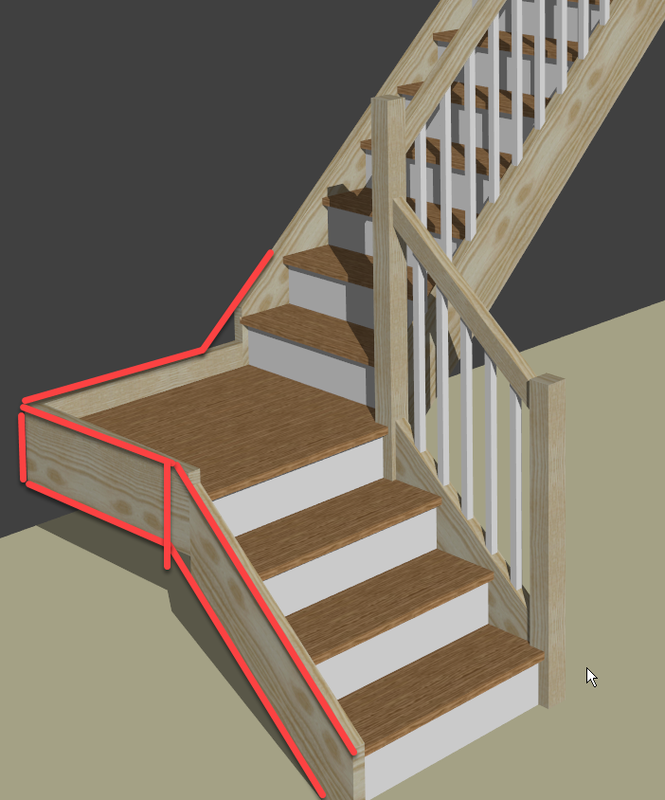 I also attach the pdf workshop document and the dimensioned plan of the stair and a drawing showing the landing string adjustments in red, that you’ll need to make to the StairDesigner output. Can you confirmation these modifications to the project and if OK, I’ll process all the other documents. No this is not correct, please fix and send me the working drawings. While processing your project I’ve noticed that steps and risers have no assembly details. OK thank you, the last model you send was perfect. You can send the working documents. I’m attaching a couple of pdf files of the 3D views printed from StairDesigner. However you can’t print from the free version. To print the 3D rendered view from the demo version, just do a screen capture and past into another document. What do you think of the last StairDesigner model I sent? If it’s OK can I send you the working documents. Thank you for the documents and all your help, much appreciated. Is it possible to print an A3 3D render of the stairs. You have bought a StairFile service this means that you send us your project designed with the free version and we’ll send you back the manufacturing documents. If you require it, we’ll also revise your project so make sure that it’s optimised. If not just tell us and I’ll process your project and send you the documents. 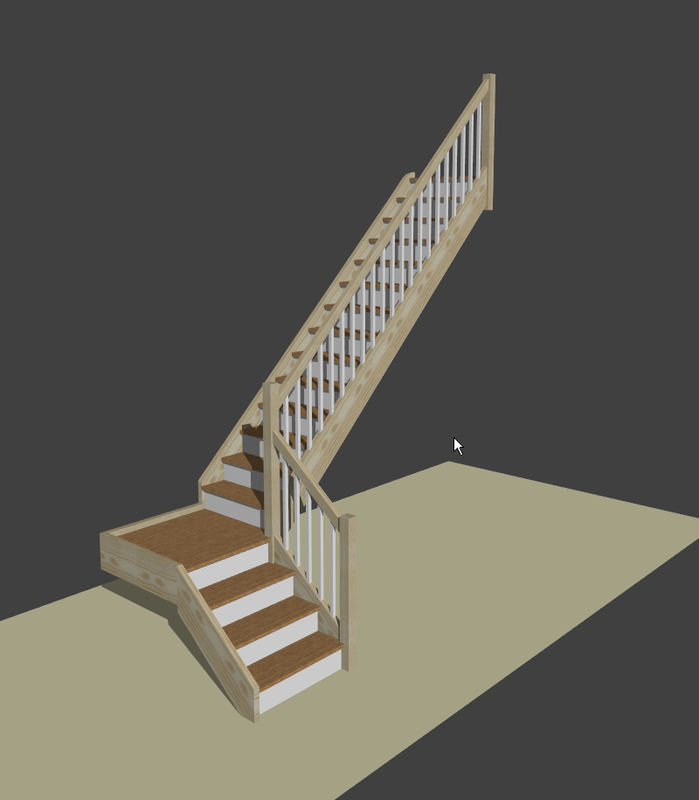 Can you take a look at the stair model I’m sending and tell me if this suits your needs. I’m also attaching the workshop document for verification. If this model doesn’t meet your requirement, please modify and re-post the modified project. 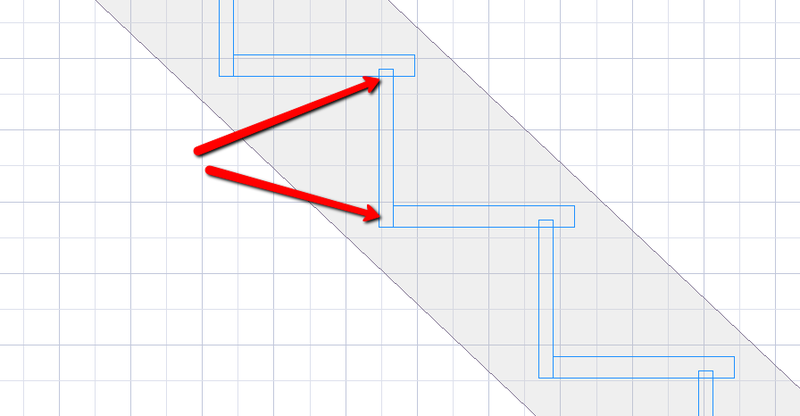 Please note that in StairDesigner v7 flight dimensions are from nosing to nosing. Don’t hesitate to ask our advise if necessary. -I have had experience with building stairs, I’m a joiner by trade and going to be using a template and a router to route the stringers. -I just want to build a stair case to access my roof space. 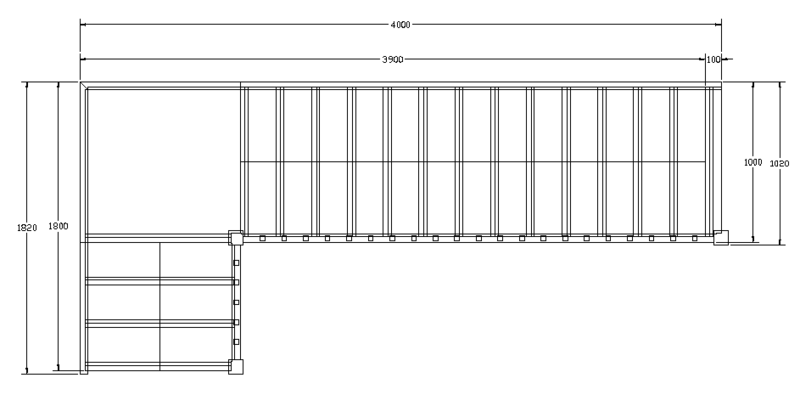 Room dem: 3400mm x 3789mm to the top of the floor in the roof space, I’m going to build in the roof space, I all I need is a basic set of drawings so I can print and work from. -The materials that I would like to use are some type hard timber that is readily available in Australia. Could you tell me how to activate my stair designer. Thank you for your time!! Thanks for buying a StairFile and posting you stair project. This service includes a complete revision of your project to make sure the design is correct and optimised for the way you intend to build the project. To make the most of this service and so that we can advise you correctly, can you send some more details on your project? – do you have a plan or dimensioned sketch of the stair well with the stair constraints. This should include the general dimensions as well as the details of the well ans especially the state of the joists at the top of the stair and some explanation and drawing of how you are thinking of making the transition from the stair to the first floor. this should include details of step to floor transition and post to joist assembly. If possible please post any photos that you have of the stair well and details, these can be a great help in understanding quickly how the stair well is set up. Please note that the general stair well dimensions are very important and will enable us to check that you design is correctly set up to fit. Any errors could result in you spending money and many hours building the stair and finding it unusable when you come to install it. – a description of the type and style of stair you are trying to build, with eventually some photos of finished stairs that you like or are trying to imitate. – a description of the way you are thinking of building the stair. This should include whether you are doing this by hand, with traditional tools or using CNC or subcontracting machining of parts. A description of the facilities you have would also be helpful, with a list of the tools you have, workshop size, people working with you, etc. – a description of your previous experience skills in wood working and stairs building. Please also tell us if you have specific ways of doing your wood working, notably what joints you are used to using or would like to use. – a description of what raw materials you want to use. What wood will you be using and will you be using pre-manufactured panels or rough timber? What are the exact thicknesses and sections of the different stair components you want to use? As you have asked for a nesting optimisation of your parts can you send the different sheet sizes that will be used. I’ve seen that you have set up the stair using StairDesigner 7. This version is still in beta and has a few limitations. In your project the main point I’ve noticed is the string board joints around the landing. 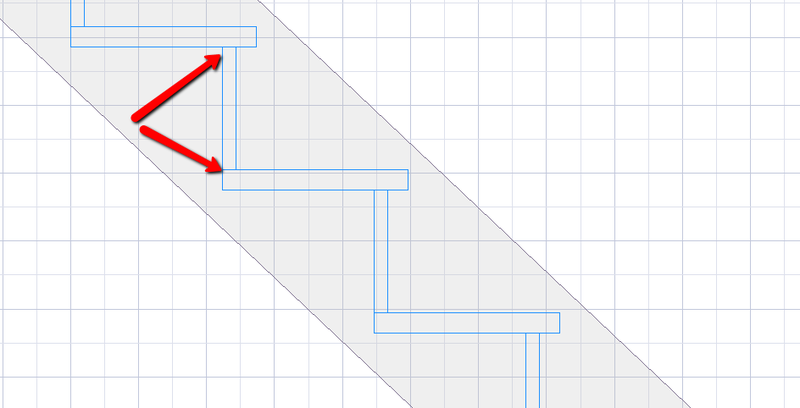 StairDesigner 7 doesn’t optimise this very well yet and we’ll need to do this by editing drawings in CAD. This is not a problem and I can do this for you if you want within the stair file service. Can you have a look at the attached design and tell me what you think. I’m looking forwards to working with you.